Last week, the Boston Redevelopment Authority (BRA) granted Historic Boston Incorporated and Roslindale Main Street interim designation for redevelopment of the Roslindale Substation, a 1911 industrial building located in the center of Roslindale Square. The Substation, vacant since the 1980s, is currently owned by the BRA. The two non-profit organizations, who worked together in 2002 to create a feasibility study for the building, will come together again to determine a viable use for the complex building. In 2008, the BRA sought proposals from private developers, which resulted in several strong submissions with creative re-use ideas for the substation. The troubled economy, however, changed the credit markets and the viability of these proposals. The BRA withdrew the last round of RFP submissions because none were financially feasible. As non-profit development organizations, Historic Boston and Roslindale Main Street have access to resources unavailable to private developers and don’t require the same fee structure that many for-profit developers need in order to complete small but complicated projects like the Roslindale Substation. Both organizations are committed to putting together a great project that will preserve the historic Substation building and provide uses that will serve the vibrant Roslindale community. 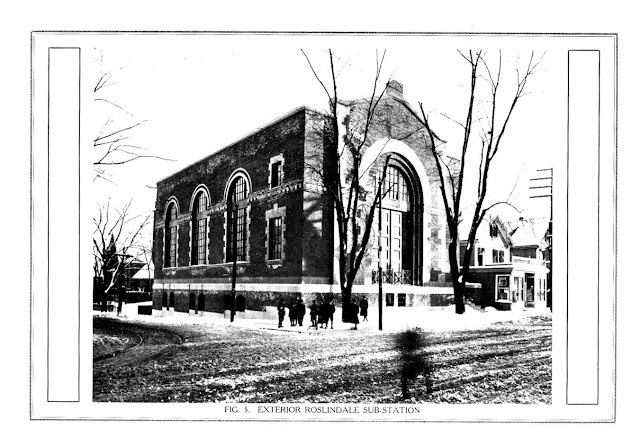 Overlooking Adams Park in Roslindale Square, the Roslindale Substation was built as an electrical power conversion and transmission station, constructed as part of the Boston Elevated Railway's rapid transit system in 1911. Designed in the Neo-Classical Revival style by the Stone and Webster Engineering Corporation and architect Robert S. Peabody, the Substation converted alternating electric current (AC) transmitted from a new South Boston Power Station via underground cables into direct current (DC) for use by local trolley cars. With advanced technology for the day, this system generated and distributed additional power at lower costs. The construction of the substation in 1911 also marks a time when Roslindale was expanding and becoming a very popular suburban residential and commercial neighborhood. The electric trolley car system helped to spur on that development and settlement. For more information about Historic Boston’s lasting interest in the Roslindale Substation, please read more here.